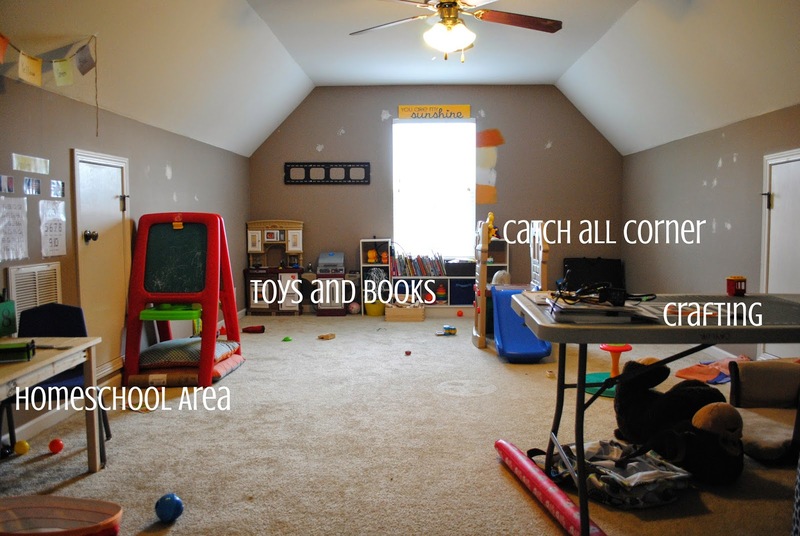 Our playroom is a great space. We absolutely love it...but the color....we have hated it since we moved in over 5 years ago. As you can see I put several paint samples on the wall but we never finalized anything. 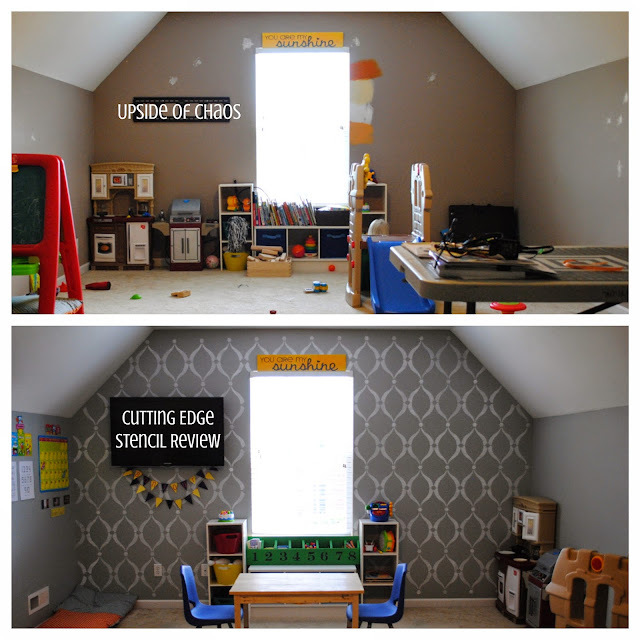 So when Cutting Edge Stencils asked me to do a product review I knew we were finally going to get rid of that awful paint from the previous owners. I chose to use the Sweet Dreams stencil from the Nursery stencil section and it's perfect for our space. 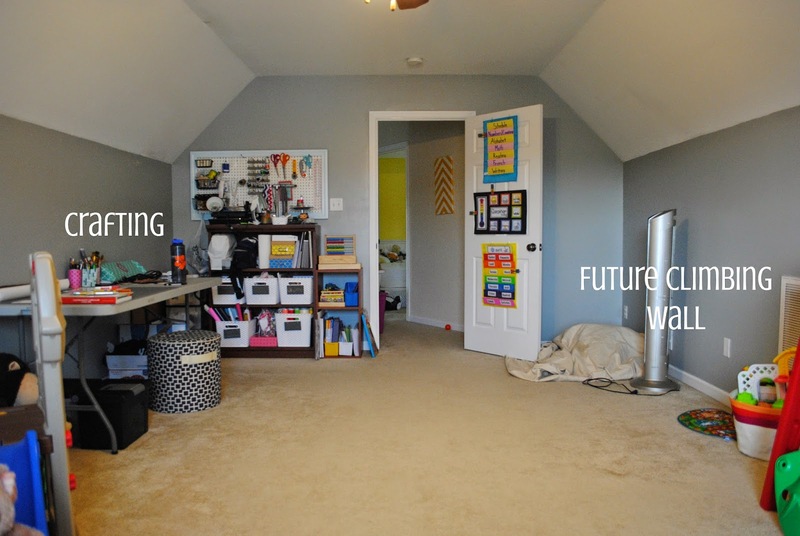 This was also going to be a great time to rearrange and make the room function better for our family. Not only is this our playroom, but it's also our home school room, and where do I do all my crafting and blogging. The current layout just isn't working for us. It feels small and cluttered. So one day I had my mom come out to keep the kids mostly distracted from what I was doing and I went to work with the base coat of paint. I got my handy dense foam roller with rounded edges, a stencil brush (for reaching the corners the roller doesn't quite get), and a very handy level to make sure your work turns out great! For my accent wall color I chose to use Liquitex Titanium White from Hobby Lobby. I worked a little backwards from how you're supposed to do the stencils. I started up as high as I could standing on the ground and then worked my way down. (I didn't have anyone to help with the kids and ladders just aren't an option with two little Tarzan wannabes) That evening when my hubs came home I continued with no issues because the stencils are interlocking! I used light pressure on the roller. I didn't want the stencil or the paint to be too severe. 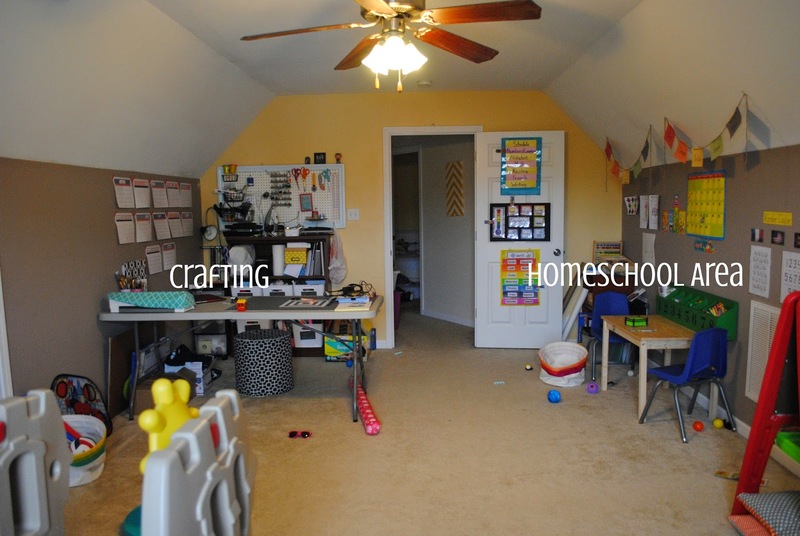 Even though we do our school work here I want this is be a relaxed space where the kids can also go crazy. I even had a half a stencil which could be flipped and turned to make all four sides of this design for the funky angles on the walls. My favorite extra stencil was the border. I used this to go above the window and finish the design before the kids came back in and tried to climb on everything! Not even two hours of combined work and check out this wall! Our room feels so much bigger and nicer with the accent stencil! Isn't this the best stencil pattern! And now that walls are done I took the time to reorganize and change our layout in the playroom and I'm absolutely in love! 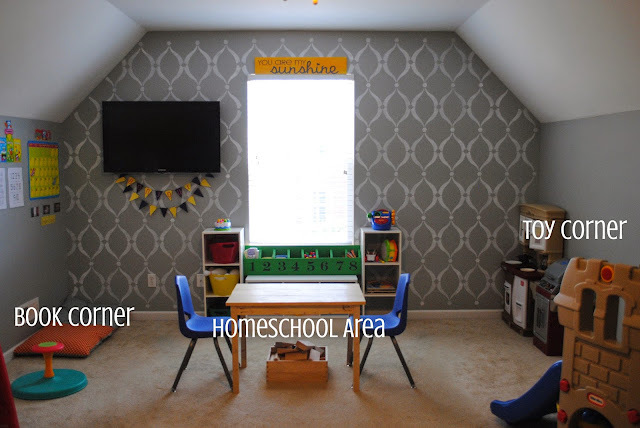 I'm thinking of doing a second accent wall using the Sweet Dreams Stencil back here after we get our climbing wall installed! 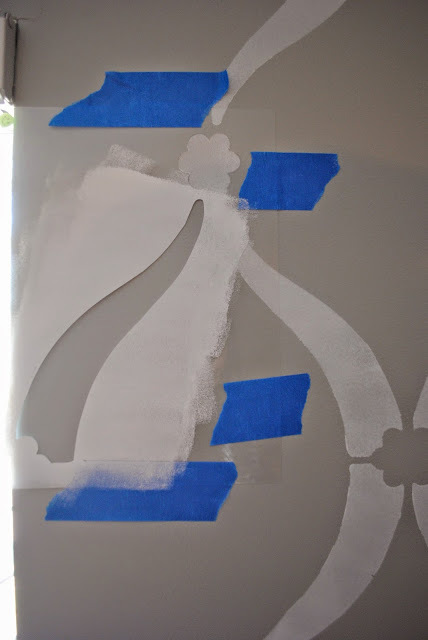 If you want to check out some more ideas for stencil projects check out Cutting Edge Stencils Blog. 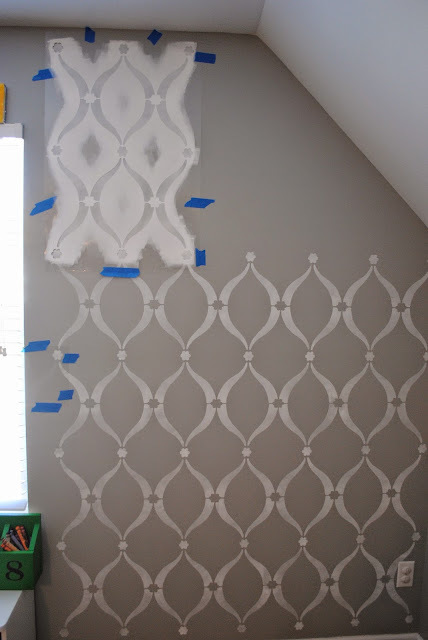 Do you have a space in your house you'd love to make over with a stencil pattern? *Cutting Edge Stencils provided me with the stencils, roller, level, and brush. But all thoughts, opinions, and love of products are my own. Oh wow, that's what I cal DIY! !